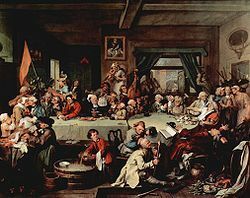 William Hogarth painting of a spirited political dinner at an 18th century restaurant tavern. After reading Steven Johnson’s “Where Good Ideas Come From: The Natural History of Innovation” a third time through and taking meticulous notes, I’m more convinced than ever that it should serve as one of the manuals, if not the principal manual, for Extension’s transformation into a 21st knowledge organization. I hope you are as equally convinced after reading this. Johnson devotes much of the book to debunking the longstanding notion that good ideas stem from eureka moments. As it turns out, though, this understanding is far off the mark, Johnson contends. “As rhetorically florid as these [metaphors] all are, they don’t strike at the truth because they depict ideas as a single thing — something that happens at an illuminating moment,” he says. Actually, ideas begin as networks at the most elemental level — our brains. That’s only half the story. As Johnson and others have discovered, good ideas emerge within similar sorts of external networks, which mimic the internal environment of the human brain. The trick — that is to say, the optimal way to ensure the formation of ideas — is to place oneself into an environment where new external networks are likely to form. Johnson describes these environments as liquid networks, rather boisterous places which closely resemble William Hogarth’s painting of a densely crowded tavern room where a political dinner is being held. “This is the kind of chaotic environment where ideas are likely to come together, where people from different backgrounds were likely to have new, interesting, unpredictable collisions,” he says. As counterintuitive as it may seem, research has supported this view. For example, researcher Kevin Dunbar employed a “Big Brother” approach to determine whether monumental breakthroughs in scientific laboratories really were the result of eureka moments — those sparks of brilliance that allegedly occur as scientists peer through microscopes. As it happens, most good ideas occur around the conference table — the weekly lab meetings where everybody assembles and shares their latest data and findings. Indeed, Johnson says one of the challenges of the future will be building more of these spaces — spaces where individuals behave much like those in Hogarth’s classic painting. For my part, I’m both inspired and disturbed by the views Johnson presents in his book and his TED lecture (posted below). He’s right to argue that one of the preeminent concerns of organizations in the future will be creating the optimal conditions in which these sorts of liquid networks can thrive — that’s the inspiring part. The part that disturbs me is best expressed by this question: Is Cooperative Extension up to the task of building liquid networks in the 21st century? I’ve stressed a time or two in this forum how Extension once dominated the knowledge landscape. Borrowing Johnson’s terminology, we once excelled in building optimal networks, not only among ourselves but on behalf of our clients. What were the agricultural societies of the 18th and 19th century other than attempts to build these optimal learning environments? For that matter, what were Seaman Knapp’s experimentation with cotton demonstrations, Washington’s use of farm conference’s and P.O Davis’s development of radio listening clubs other than attempts to optimize not only the spread but also the cross-fertilization of ideas? Even so, how well equipped are we to nurture these environments in the 21st century? Granted, we are still constructing networks but are we making adequate use of emerging Web 2.0 technologies? Even more important, are these networks as efficient, open and responsive as they should be — efficient, open and responsive enough to merit continued support from our stakeholders? As I see it, that remains the million-dollar question — literally.